The film relates how, from a secret base built in the Antarctic, the first Nazi spaceships were launched in late 1945 to found the military base Schwarze Sonne – Black Sun – on the dark side of the Moon. This base was to to be used to build a powerful invasion fleet and return to take over the Earth once the time was right, in this case 2018. 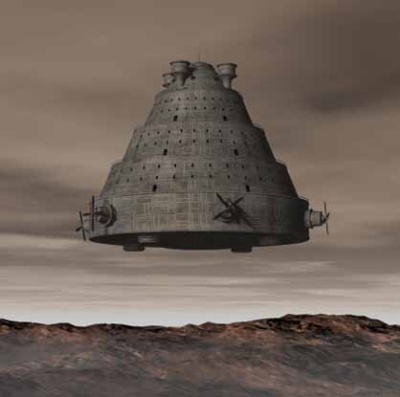 But a new report out this week in Germany in the magazine PM purports that there is “strong evidence” that a Nazi UFO programme was well advanced. Hitler ordered Luftwaffe chief Hermann Goering to develop the super weapon that would change the war. The PM report quotes eyewitnesses who believe they saw a flying saucer marked with the Iron Cross of the German military flying low over the Thames in 1944. At the time the New York Times wrote about a “mysterious flying disc” with photos of the device seen travelling at extremely high speeds over the high-rise buildings. The best known of the Nazi UFO projects was the Schriever-Habermohl scheme, named for Rudolf Schriever and Otto Habermohl. Initially a Luftwaffe project, it fell under the auspices of armaments minister Albert Speer before being taken over once again in 1944 by Hans Kammler. Joseph Andreas Epp, an engineer who served as a consultant to the Schriever-Habermohl project, stated 15 prototypes were built in all. He described how a central cockpit surrounded by rotating adjustable wing-vanes formed a circle. The vanes were held together by a band at the outer edge of the wheel-like device. The pitch of the vanes could be adjusted so that during take off more lift was generated by increasing their angle from a more horizontal setting. In level flight the angle would be adjusted to a smaller angle, similar to the way helicopter rotors operate. The wing-vanes were to be set in rotation by small rockets placed around the rim like a pinwheel. After the craft had risen to some height the horizontal jets or rockets were ignited. “After this the wing-blades would be allowed to rotate freely as the saucer moved forward as in an auto-gyrocopter. In all probability, the wing-blades speed, and so their lifting value, could also be increased by directing the adjustable horizontal jets slightly upwards to engage the blades, thus spinning them faster at the digression of the pilot,” he said.